The area between Koyu and Shinyu covered in white soil (solfataric soil) is the Unzen Jigoku area. In Buddhist teachings, Jigoku (hell) is where people are punished for their evil deeds that they committed in the past life. With extremely high temperature hot springs and gasses erupting from everywhere, among the strong smell of sulfur and billowing steam, indeed conjures images of the fearsome Jigoku. It has been thought that the source of Unzen's energy is the magma reservoir at the bottom of Tachibana bay. 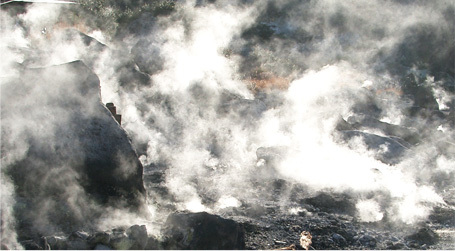 The high temperature, high pressure gasses rise through the fissures in the bedrock, and in the process undergo a chemical change, and become extremely hot water. 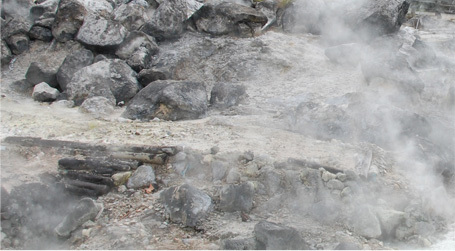 The gasses caused by the boiling hot water come out as violent gasses, and Unzen's hot springs are made from a combination of those gasses and the groundwater from the surrounding mountains. 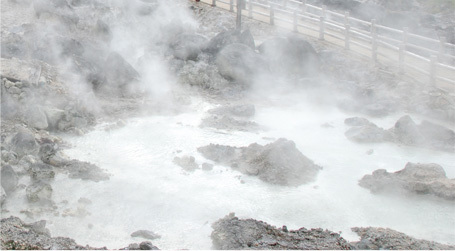 The spring quality of Unzen's hot springs is acidic sulfur springs, with strong acidity. The hot springs can become as hot as 98℃, and the main components are iron ion, aluminum ion, and sulfate ion, and is effective against rheumatism, diabetes, and dermatosis. Furthermore, the gasses that erupt along with violent sounds can go up to temperatures of 120℃. Mostly composed of steam, it is also composed of carbonated gas and hydrogen sulfide gas, and gives off a strong sulfuric smell. 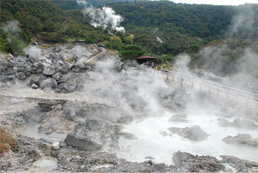 The rocks in the Jigoku area have been affected by the heat from gasses and hot springs, and acidic water to become white, clay-like solfataric soil. You can see the white to pale yellow Yunohana around the fumaroles at the Jigoku. This occurs when the hydrogen sulfide in the gasses react to the iron and aluminum in the soil and become crystallized. At Unzen, the characteristics of Yunohana is that they are not found in the water, but on the ground. 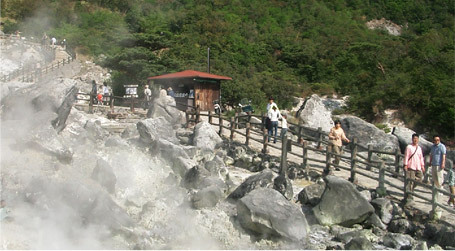 Unzen Jigoku is Unzen hot springs town's main tourist attraction, and have over 30 Jigoku's, such as Daikyokan, Oito, and Kiyoshichi, and have white steam billowing from the fumaroles. Furthermore, it is famed for being the stage for Christian martyrdom during the Edo period.